AJ Arnolie (front) has been coming on lately and is one key to the Warhawks duplicating the postseason success of the past two years. 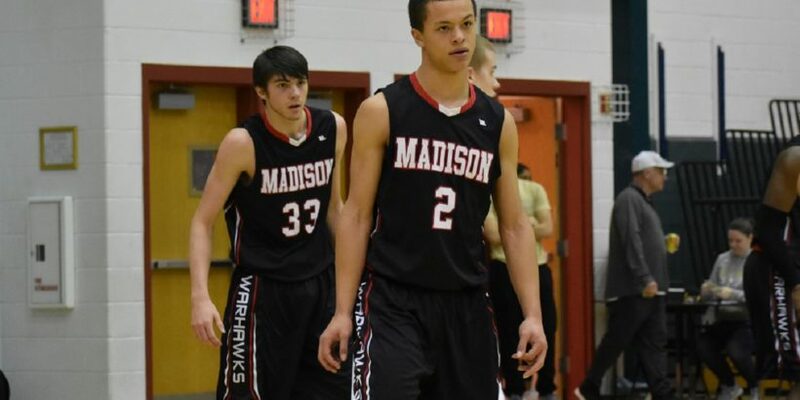 The Madison Warhawks have had an up-and-down season so far this year, but everyone around the region is watching the Warhawks closely. That’s because the last two years they have ripped through regionals to qualify for the state tournament. 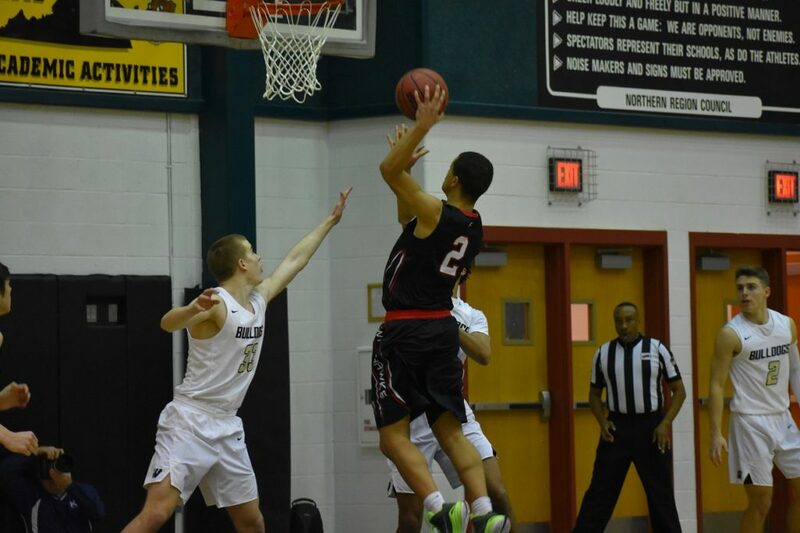 Last February Madison qualified for states by winning at Westfield in the regional tournament, 61-46. Saturday night on that same floor senior AJ Arnolie scored 18 points to lead the Warhawks to a 61-44 victory over the Bulldogs. With the teams unable to practice hardly at all this week because of the snow the game was a far cry from playoff-caliber basketball. Still, with the convincing victory on the road, one couldn’t help but wonder if the Warhawks are again destined to be a postseason threat. One of those kids is Arnolie, who has noticeably been a big factor of late for Roller’s team. He’s averaged well into double figures so far this calendar year and his 18 points Saturday was on 9-13 shooting from the field. He’s got a very solid mid-range game and possesses length and athleticism that allow him to get to the rim. Oh and Arnolie, who has been admitted to Stanford, is about as smart as kids come as well. The smooth left-hander Arnolie gets to the rim in the second half for two of his 18 points. It took a while for Arnolie and the Warhawks (3-3, 11-9) to get going. After one period they trailed 7-4 and Roller’s squad did not look sharp. In the second quarter the ball movement got better and the Warhawks scored 20 points to lead at halftime by three. The third quarter, which Roller referenced as almost ideal, was even better. The Warhawks started it with an 8-1 run and scored 22 points in the quarter total to lead 46-34 at its conclusion. Then, Madison started the fourth with another 8-1 run to effectively seal the deal. After an awful first quarter shooting the ball the final stats showed how efficient Madison was in the final three. The Warhawks ended up shooting almost 50% from the field and shot over 80% from the free throw line. Arnolie’s smooth performance on offense stood out but he had ample help. 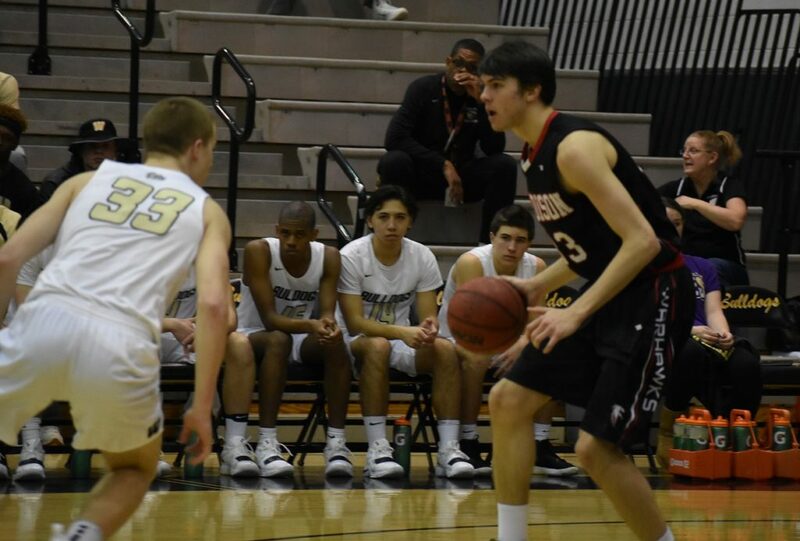 The other starters–John Finney, TJ Ulrich, Max Johnson, and Soren Almquist–combined for 32 points. It seemed everyone was contributing equally as the Warhawks were able to move the ball to the open man against the Bulldogs’ trapping defense–on the night Madison had 15 assists on its 21 field goals. Versatile junior forward Soren Almquist (nine points) was also cited by Roller for his improved play. Westfield (1-5, 2-14) senior star Marshall Reed kept the Bulldogs in the game with 17 points and eight rebounds. The tall guard was physical, getting to the line 11 times on the night. But Reed had to work hard for his points, with Arnolie and Finney playing solid defense on him most of the evening. No other Bulldog managed more than two field goals and the Westfield bench didn’t help matters by drawing two technicals to sway momentum in the crucial second and third quarters.